Figs. 4a - d illustrate a model for the acquisition and processing of STQ(d) and STQ(v) elapse times (see also Figs. 3a-g) and for temporal and motoric auto-adaptation in a molecular/biological context. The basic elements of the model have already been described in the neurophysiology literature by KATZ, GRAY, KELLY, REDMAN, J. ECCLES and others. The present invention is of special originality because temporal and motoric auto-adaptation is effected here by means of STQ quanta, which are described for the first time here. Such systems consist mainly of numerous neurons (nerve cells). The neurons are interconnected with receptors (sensory neurons), which enables the recording and recognition of the neurons' physical surroundings. In addition, the neurons cooperate with effectors (e.g.muscles) which serve as command executors for the motoric activity. The expression "receptor" or "sensory neuron" corresponds to the mechanistic term "sensor". An "effector" is the same as an "actuator", which is a known term in the cybernetics literature. Each neuron consists of a cell membrane that encloses the cell contents and the cell nucleus. Varying numbers of branches from the neurons (axons, dendrites etc.) process information off to effectors or other neurons. The junction of a dendritic or axional ending with another cell is called a synapse. The neurons themselves can be understood as complex biomolecular sensors and time pulse generators; the synapses are time data analyzers which continually compare the currently recorded elapse time sequences with prior recorded elapse time patterns that were produced by the sensory neurons and were propagated along nerve fibers towards the synapses. In turn, a type of "covariance analysis" is carried out there, and adequate probability density signals are generated that propagate to other neighboring neural systems or to effectors. a) If the threshold P1 is not exceeded, then a so-called "electrotonic potential" EP is produced which propagates passively along the cell membrane (or axon fiber), and which decreases exponentially with respect to time and distance traveled. The production of EP is akin to igniting an empty fuse cord. The flame will stretch itself along the fuse, becoming weaker as it goes along, before finally going out. EP's originate with each stimulation of a neuron. (b) If the threshold P1 is exceeded, then an "action potential" AP (as in Fig. 4a) is produced whichpropagates actively along the cell membrane (or axon fiber) with a constant amplitude in a self- regenerating manner. The production of AP is akin to a spark incident at a blasting fuse: the fiercely burning powder heats neighboring parts of the fuse, causing the powder there to burn, and so on, thus propagating the flame along the fuse. AP's are used in the quantization of STQ(d) and STQ(v) elapse times. They are practically equivalent to identification pulses IP with periods t(P1), t(P2), t(Pn)..., which are shown in Fig. 3a. AP's signal the occurrence of the phase transitions from which STQ(d) and STQ(v) elapse times derive. In addition,the AP' indirectly activate the molecular/biological "timers" that are used for recording these elapse times. But AP's do not represent deterministic sampling rates for amplitude scanning; and they do not correspond to electronic voltage/frequency converters. Moreover, their amplitude is independent of the stimulation intensity at the receptor, and they do not represent the time counting pulses used in the measurement of elapse times. Rather, the recording of STQ elapse times is effected and modulated by the velocity with which the action potentials propagate along the nerve fibers (axons) and membrane regions. The time measuring properties of AP's are described in detail in the following section: If an EP, in answer to a receptor stimulus, exceeds a certain threshold value (P1) 13, then an AP is triggered. The amplitude trace of an AP begins with the upstroke 14 and ends with the repolarisation 15, or with the so-called "refractory period", respectively. At the end of this process, the membrane potential decreases again to the resting potential P0, and the ionic distribution returns to equilibrium. Not each receptor stimulus generates sufficient electric conductivity to produce an AP. As long as it remains under a minimal threshold value P1, it generates only the electrotonic potential EP (introduced above). (For a better understanding of elapse time measurements in biological/chemical structures, see Fig. 2c and Fig. 3a). The first AP, which is triggered after a receptor is stimulated, generates initially (indirectly) the impulse that activates the first timer that records the first STQ(d) elapse time, when the signal amplitude W passes through the threshold value of the potential P1 at phase transition iTw(1.1). This signal represents simultaneously an identification pulse IP. The first AP corresponds to the first IP in a sequence of IP's that represents the respective threshold value status or perception zone in which the stimulation amplitudes were just found. As long as the stimulus at the receptor persists, an AP 16a, 16b... is triggered in temporal intervals whose duration depends on the respective thresholds in which the stimulus intensities have just been found. These temporal intervals correspond to those IP periods t(P1), t(P2),... that are required for serial allocation and processing of STQ elapse times (see Fig. 3a). The AP frequency is stabilised through the so-called "relative refractory period" (i.e. downtime) after each AP, during which no new depolarisation is possible. Because the relative refractory period shortens itself adaptively in proportion to the increase in stimulation intensity at the receptor (e.g. if the EP reaches a higher threshold value P2 (or perception zone) 13a), there is a similarity here with "programmable bi-stable multivibrators" found in the usual mechanistic electronics. The downtime (refractory period) after an AP is shown as the divided line 19. Fig. 4a illustrates an "absolute refractory period" t(tot) following a repolarisation. No new AP can be created during this time, irrespective of the stimulation intensity at the receptor rises. The maximum magnitude of a recognizable receptor stimulus is programmed in this way. Of importance is the fact that both the duration of the relative refractory period as well as character of the absolute refractory period are subordinate to auto-adaptive regularities, and are therefore continually adapting to newly appearing conditions in the organism. Consequently, the threshold values P0, P1, P2.... from which STQ quanta are derived are themselves not absolute values, but are subject to adaptive alteration like all other parameters; including, in particular, the physical "time". We shall now elaborate upon what happens after the first STQ(d) elapse time at P1 is recorded via the first AP: If the stimulation intensity (with a theoretical amplitude W) increases from the lower threshold P1 to the next higher threshold P2, then the following AP triggers indirectly the recording of the second STQ(d) elapse time as soon as a phase transition occurs through the next higher threshold P2. The same process is repeated in turn for the threshold values P3, P4, ... and so on. In each case, the AP functions simultaneously as an identification pulse IP, as described in Fig. 3a. It therefore recurs in threshold-dependent periods as long as a perception acts upon the receptor (i.e. for as long as the receptor is perceiving something). As an example, consider also Fig. 3a: As long as the stimulation intensity remains in the zone P2, the AP 17, 17a, 17b.... recurs in short temporal periods. These periods (or intervals) are similar to those periods of IP identification pulses (with period t(P2)) that are required for serial recording of the STQ elapse times Td(2) and Tw(2). When the increasing stimulation intensity reaches the threshold value P3 (or perception zone 3) 13b, the AP's recur in even shorter time periods 18a, 18b, 18c... This corresponds to the IP identification pulses with the period t(P3), shown in the figure, which are indirectly required for serial timing of the STQ elapse times Td(3) and Tw(3). An even larger stimulation intensity, for example in P4 (perception zone 4), would generate an even shorter period for the AP's. This would correspond approximately to t(P4) in Fig. 3a. The maximum possible AP pulse frequency is determined by t(tot). Shorter refractory periods, after the depolarization of APs, also produce smaller AP-amplitudes. This property simplifies the allocation of AP's in addition. In the following, the generation of the actual time counting pulses for STQ quantization is detailed. These pulses are either invariable ITCP or vm-proportional VTCP, as illustrated in Fig. 3a. The time counting pulses for the quantization of elapse times are dependent on the velocity with which the AP propagate along an axon. This velocity is in turn dependent on the "rest potential" and on the concentration of Na+ flowing into the intracellular space at the start of the depolarization process, as soon as perception at the receptor cell causes an electric current to influence the extra/intra-cellular ionic equilibrium. With the commencement of stimulation of a receptor (at the outset of a perception), only capacitive current flows from the extra-cellular space into the intracellular fluid. This generates an "electrotonic potential" EP, which propagates passively. If this EP exceeds the threshold P1, then an AP, which propagates in a self-regenerating manner along the membrane districts, is produced. The greater the capacitive current still available after depolarisation (or "charge reversal") of the membrane capacitor, the greater the Na+ ion flow into the intracellular space, and the greater the available EP current that can flow into still undepolarized areas. The rate of further depolarization processes in the neuronal fibres, and consequently the propagation speeds of further AP's, are thus increased proportionally. The charge reversal time of the membrane capacitor is therefore the parameter that determines the value 12 of the resting potential P0. When a stimulus ("excitation") starts from the lowest resting potential 12, then the Na+ influx is the largest, the EP-rise is steepest and the electrotonic flux is maximum. If an AP is triggered, then its propagation speed is in this case also maximum. But when a receptor stimulus starts from a higher potential 12a, 12b, 12c...., then the Na+ influx is partially inactivated, and the steepness of the EP-rise as well as its electrotonic flux velocity is decreased. Therefore, the propagation speed of an AP decreases too.These specific properties are used in molecular/biologic organisms to produce either invariant time counting impulses ITCP, with periods tscan, or variable time counting impulses VTCP with periods t.vscan. In the latter case, the VTCP's are modulated in accordance with the relative speeds vm (via the STQ(v) parameters), and therefore have shorter intervals (see Figs. 3b, 3c). The STQ(v)-quantum is determined by the deviation of the respective starting-potential from the lowest resting-potential P0, which serves as a reference value, and is measured by the duration of the capacitive charging of a cell membrane when a stimulus occurs at the receptor. The duration of the charging is inversely proportional to the velocity of the Na+ influx through the membrane channels into the intracellular space. A cell membrane can be understood as an electric capacitor, in which two conducting media, the intracellular and the extracellular solution, are separated from one another by the non-conducting layer, the membrane. The two media contain different distributions of Na/K/Cl ions. The greater the "stimulation dynamics" (see below) that first influences the outer molecular media - corresponding to sensor 2 in Fig. 2a - and, subsequently, the inner molecular media - which corresponds to sensor 1 in Fig. 2a - the faster is the Na+ influx and the shorter the charging time (which determines the parameter for the relative speed vm), and the faster is the AP propagation velocity v(ap) in the neighbouring membrane districts. The signals at the inner and outer sides, respectively, of the membrane, correspond to the signal amplitudes V and W. The velocity v(ap), therefore, indirectly generates the invariant time counting pulses ITCP or the variable vm-proportional time counting pulses VTCP. These variable VTCP pulses are self-adaptive modulated time pulses that are correlated to the relative length. As explained in the following (contrary to the traditional physical sense), no "invariant time" exists -- only "perceived time" exists. Of essential importance also is the difference between "stimulation intensity " whose measurement is determined by the AP frequency and therefore by the refractory period, and the "stimulation dynamics", whose measurement is defined by the charge duration of the cell membrane and therefore also by the speed of the Na+ influx. "Stimulation dynamics" is not the same as "increase of the stimulation intensity". It is a measure of the temporal/spatial variation of the position of the receptor relative to the position of the stimulus source, and therefore of the relative speed vm. The stimulation intensity corresponds to signal amplitudes, from which vm-adaptive STQ(d) elapse times Tδ(1,2,3...) are derived, while the stimulation dynamics is defined by the acquired STQ(v) parameters. Fig. 4b and Fig. 4c show the analysis of STQ elapse times in a molecular/biological model in an easily comprehensible manner. The results of the analysis are used to generate redundancy-free auto-adaptive pattern recognition as well as autonomous regulating and self-organization processes. The organism in the particular example shown here is forced to distinguish certain types of foreign bodies that press on its "skin". It must reply with a fast muscle reflex when it recognizes a pinprick. But it should ignore the stimulus when it recognizes a blunt object. A continuous vm-adaptive recording of STQ(d) elapse times by means of VTCP pulses is necessary to do this. The frequency of these time counting impulses is modulated in accordance with the STQ(v) parameters of the stimulus dynamics (vm). These STQ(v) parameters are required for the recording of the STQ(d) elapse times Tδ(1,2,3...) from the signal amplitude at the current stimulus intensity. The difference between "stimulation intensity" and "stimulation dynamics" is easily seen in this example. A stimulus can even show a different intensity if no temporal-spatial change takes place between signal source and receptor. A needle in the skin can cause a different sensory pattern even when its position is not changing if, for example, it is heated. This sensory pattern is determined by the signal amplitude, and consequently by the AP frequency and by the STQ(d) quanta. As long as the needle persists in an invariant position, the AP propagation velocity is constant, because the membrane charging time is constant too. During the prick into the skin, there is a "dynamic stimulation", and the STQ(d) quantization of the signal amplitude is carried out in a manner that depends on the pricking speed vm. It should be noted that two temporally displaced signal amplitudes (at the inner and outer membrane surface) always exist during this dynamic process. The STQ(v) parameters are derived from this. The AP propagation velocities and the acquired STQ(d) time patterns are adapted accordingly ("temporal auto-adaptation"). Fig. 4b shows the vm-dependent propagation of an AP from a sensory neuron (receptor) 20 along an axon to a synapsis, where a comparison of acquired time sequences takes place through molecular" covariance analysis". This receptor functions like a "pressure sensor". If a needle 21 with a certain dynamics impinges on the outer side of the cell membrane, then this stimulation causes triggering of AP's 23 as described in Fig. 4a. The AP's propagate in the axon 22 with a STQ(v)-dependent speed vap. The sequence (a'.....v') represents the signal amplitude values that are produced by the pinprick. The sequence begins with the phase transition at the first threshold value P1, continues over P2, P3, P4 (at which point the stimulus maximum is attained), and finally to the phase transitions through P3 and P2. The intensity zones for stimulus perception are designated with Z1, Z2, Z3 and Z4. The periods t(P1), t(P2), t(P3), t(P4)......, and the magnitudes of the AP's serve to identify the particular threshold in which the stimulation intensity is currently to be found. Their temporal sequence is therefore a type of "code". AP's are not time counting pulses. Besides their coding function, they also serve as (indirect) activating and deactivating pulses for the recording of STQ(d) elapse times. The actual vm-dependent measurement of the STQ elapse times Td(1), Td(2), Td(3), Tw(4) and Td(4)... (see Fig. 2c), as well as the comparison of these with previously recorded elapse times, takes place in the synapse 24. At the presynaptic terminal of the axons, the AP's 23 arrive with variable velocities vm(n...), according to the dynamics of the needle prick as well as the measured STQ(v) parameters. This variable arrival velocity at the synapses is the key to producing the adaptive time counting impulses VTCP (see Fig. 3c) with vm-modulated frequency ƒscan. The synapse is separated from the postsynaptic membrane by the "synaptic cleft", and the postsynaptic membrane, for its part, is interconnected with other neurons; for instance, to a "motorneuron" 25. This neuron generates a so-called "excitatory postsynaptic potential" (ESPS) 27 that is approximately proportional to the convergence probability g. If this EPSP (or, equivalently, the probability density g) exceeds a certain threshold value, then, in turn, an action potential AP 28 is triggered. This AP is communicated via motoaxon 26 to the "neuromuscular junction", at which a muscle reflex is triggered. The incoming AP sequences 23 generate the release of particular amounts of molecular transmitter substance from their repositories - tiny spherical structures in the synapse, termed "vesicles". In principle, a synapse is a complex programmable timedata processor and analyzer that empties the contents of a vesicle into the presynaptic cleft when the recurrence of any prior recorded synaptic structure is confirmed within a newly recorded key sequence. The synaptic structures and vesicle motions are generated by the dynamics (vap) of the AP ionic flux, as well as by its frequency. AP influx velocities v(ap) correspond to the STQ(v) elapse times, and AP frequencies correspond to the STQ(d) elapse times. The transmitter substance is reabsorbed by the synapse, and reused later, whereby the cycle continues uninterrupted. We now present a detailed description of Fig. 4b (referring also to Figs. 4e and 4f). The ionic influx of the initial incoming AP 23 (a') activates the spherical structures (vesicles) containing the ACh transmitter molecules. These molecules are released in the form of a "packet". The duration of this ACh packaging depends on the dynamics (represented by the velocity v(ap)) of the AP ionic influx at the presynaptic terminal, and therefore on the stimulus dynamics (represented by vm) at the receptor 20. Each subsequent incoming AP, namely b', c'..., in turn causes neurotransmitter substances in the vesicle to be released toward the synaptic cleft. Each of the following are elapse time counting and covariance analyzing characteristics:: the duration of accumulation of neurotransmitter substance T(t); the velocities v(t) with which the neurotransmitter substances move in the direction of the synaptic cleft; the effects induced by the neurotransmitter substances at the synaptic lattice at the synaptic cleft; the duration of pore opening; and so on. By means of AP's acting on synaptic structures, not only are the actual time counting frequencies ƒscan generated (to be used in vm-dependent measurement of STQ(d) elapse times as described in Fig. 2c), but also time patterns are stored and analysed. If the pattern of a current temporal sequence is recognised by the synapse as matching an existing stored pattern, a pore opens at the synaptic lattice, and all of the neurotransmitter content of a vesicle is released into the subsynaptic cleft. The released transmitter molecules (mostly ACh) combine at the other side of the cleft with specific receptor molecules of the sub-synaptic membrane of the coupled neuron. Thus, a postsynaptic potential (EPSP) is generated, which then propagates to other synapses, dendrites, or to a "neuromuscular junction". If the EPSP exceeds a certain amplitude, then it triggers an action potential (AP) of the described type, which then triggers, for example, a muscle reflex. If the potential does not reach this threshold, then the EPSP propagates in the same manner as an EP (i.e. in an electrotonic manner); an AP is not produced in this case. termed "temporal facility", results in the summation of amplitudes of the generated EPSP's, if they arrive in short sequences within certain time intervals. Each release of neurotransmitter molecules into the synaptic cleft designates an increased probability density occurring during the comparison of instantaneous vm-proportionally acquired STQ time patterns to prior vm-proportionally recorded STQ-time patterns. Increased probability density causes a higher frequency of transmitter substance release and therefore a higher summation rate of the EPSP's, which in turn produces, at a significantly increased rate, postsynaptic action potentials (AP). Therefore, a postsynaptic AP is effectively a confirmation signal that flags the fact that isomorphism between a previously and currently recorded time data pattern has been recognized. On the basis of this time pattern comparison, the object that caused the perception at the receptor cell is thereby identified as "needle"; and the command to "trigger a muscle reflex" is conveyed to the corresponding muscle fibres. Parallel and more exact recognition processes are executed by the central nervous system CNS (i.e. the brain). From the sensitive skin-receptor neuron 20, a further axonal branching 29 is connected via a synapse 30 to a "CNS neuron". In contrast to the "motorneuron" which actuates the motoric activity of the organism directly, a CNS neuron serves for the conscious recognition of a receptoric stimulation sequence. An AP 31, produced at the postsynaptic cell membrane 30, can spread out along dendrites in the axon 30a, as well as to several other CNS neurons; or, alternatively, indirectly via CNS neurons to a motorneuron, then on to a neuromuscular junction. The parameters controlling the recording of STQ time quanta in the synapses 25 and 30 can differ with different synaptic structures. (Indeed, the synaptic structures themselves are generated by continuous "learning" processes). This explains how it is possible for a needle prick to be registered by the brain, while eliciting no muscular response; or how a fast muscle reflex can be produced while a cause is hardly perceived by the brain. The first case shows a conscious reflex, the other case an instinctive reflex. The former occurs when the CNS synapse 30 cannot find enough isomorphic structures (in contrast to the synapse 25), transmitter molecules are not released with sufficient frequency, and subsequently no postsynaptic AP 31 and no conscious recognition of the perceived stimulus can take place. Numerous functions of the central nervous system can be explained in such a monistic way; as well as phenomena such as "consciousness" and "subconscious". Generally, auto-adaptive processes are deeply interlaced in organisms, and are therefore extremely complex. In order to be capable of distinguishing a needle prick from the pressure of a blunt eraser, essentially more time patterns are necessary; in addition, more receptors and synapses must be involved in the recognition process. Fig. 4c illustrates the process by which moderate pressure from a blunt object (e.g. a conical eraser on a pin) is recognized, resulting in no muscle reflex. The blunt object 32 presses down with a certain relative velocity vm onto a series of receptors in neural skin cells 33, 34, 35, 36 and 37. Several sequences of AP's 39, 40, 41, 42 and 43 are produced after the individual adjacent receptors (see also Fig. 4b) are stimulated. These action potentials propagate along the collateral axons 38 with variable periods t(P1,2,3..) and velocities vap(1..5), which result on the one hand from the prevailing stimulation intensity, and on the other hand from the respective stimulation dynamics. Since each receptor stimulus generates a different pattern of STQ(v) and STQ(d) quanta, various AP sequences a'.....m' emerge from each axon. All sequences taken together represent the pattern of STQ elapse times which characterises the pressure of the eraser on the skin. These variable AP ionic fluxes reach the synapses 44, 45, 46, 47 and 48, which are interconnected via the synaptic cleft with the motoneuron 49. As soon as the currently acquired STQ time data pattern shows a similarity to a prior recorded STQ time data pattern, each individual synapse releases the contents of a vesicle into the subsynaptic cleft. Simultaneously, this produces an EPSP at the subsynaptic membrane of the neuron. These EPSP potentials are mostly below the threshold. The required threshold value for the release of an AP is reached only when a number of EPSP's are summed. This happens only when a so-called "temporal facilitation" of such potentials occurs, as described in the previous paragraph. In the model shown, the individual EPSP's 50, 51, 52, 53 and 54 effect this summing property of the subsynaptic membrane. These potentials correspond to receptor-specific probability density parameters g1, g2, g3, g4 and g5, that represent the degree of isomorphity of time patterns. Simultaneous neurotransmitter release in several synapses, for example in 45 and 47, causes particular EPSP's to be summed to a total potential 56, which represents the sum of the particular probability densities G = g1+g3. This property of the neurons (i.e. the summing of spatially separated subliminal EPSP's when release of neurotransmitter substance appears simultaneously at a number of parallel synapses on the same subsynaptic membrane) is termed "spatial facilitation". In the described model case, the summed EPSP 56 does not, however, reach the marked threshold (gt), and therefore no AP is produced. Instead, the EPSP propagates in the sub-synaptic membrane region 49 of the neuron, or in the following motoaxon 55, respectively, as a passive electrotonic potential (EP). Such an EP attenuates (in contrast to a self-generating active AP) a few millimetres along the axon, and therefore has no activating influence on the neuromuscular junction, and consequently no activating influence on the muscle. The stimulation of the skin by pressing with the eraser is therefore not sufficient to evoke a muscle reflex. It would be a different occurance if the eraser would break off and the empty pin meet the skin receptors with full force. In this case, neurotransmitter substances would be released simultaneously in all five synapses 50, 51, 52, 53 and 54, because the acquired STQ time patterns Tδ(1,2,3..), with very high probability, would be similar to those STQ time patterns Tδ'(1,2,3... ) already stored in the synaptic structures that pertain to the event "needle prick". The EPSP's would be summed, because of their temporal and spatial "facilitation", to a supraliminal EPSP 56, and a postsynaptic AP would be produced that propagates along the motoaxon 55 in a self-regenerating manner (without temporal and spatial attenuation) up to the muscle, producing a muscle reflex. As in Fig. 4b, in the present example a recognition process takes place in the central nervous system (CNS) that proceeds in parallel. From the skin receptor cells 33, 34, 35, 36 and 37, collateral axonal branches extend to CNS synapses that are connected to other neurons 58. Such branches are termed "divergences". The subdivision of axons into collateral branches in different neural CNS districts, and the temporal and spatial combination of many postsynaptic EPSP's, allows conscious recognition of complex perceptions in the brain (for example, the fact of an eraser pressing onto the skin). Since this recognition has to take place independent of the production of a muscle reflex, the sum of individual EPSP's must be supraliminal in the CNS. Otherwise, no postsynaptic AP - i.e. no signal of confirmation - can be produced. As an essential prerequisite for this, it is necessary that auto-adaptive processes have already occurred which have formed certain pre-synaptic and sub-synaptic STQ time structures in the parallel synapses 58. These structures hold information (time sequences; i.e. patterns) pertaining to similar sensory experiences (e.g. "objects impinging on the skin" - amongst these, a conical eraser). Obviously the threshold for causing an AP in the postsynaptic membrane structure of the ZNS Neurons 58 (and therefore also in the brain) has to be lower than in the motoneuron membrane 49 described previously. Therefore also the sum of these EPSP's must be larger than the sum of the EPSP's g1, g2, g3, g4 and g5. Isomorphisms of STQ time patterns in the CNS synapses of the brain have to be more precisely marked out than those in the synapses of motoneurons, which are only responsible for muscle reflexes. The structure of the CNS synapses must be able to discern finer information, so it must be more subtle. The production of a sub-synaptic AP represents a confirmation of the fact that a currently acquired Tδ(1,2,3...) time pattern is virtually isomorphic to a prior recorded reference time pattern Tδ'(1,2,3...), which, for example, arose from a former sensory experience with an eraser impinging at a certain location on the skin. If such a former experience has not taken place, the consciousness has no physical basis for the recognition, since the basis for time pattern comparison is missing. In such a case, therefore, a learning process would first have to occur. Most of the time, however, sensory experiences of a visual, acoustic or other type, arising from a variety of receptor stimulation events, are co-ordinated with the pressure sensing experience. This explains why CNS structures are extremely intensively interlaced. CNS neurons, as well as moto-neurons, have up to 5000 coupled synapses, which are interconnected in a multifarious manner with receptor neurons and axonal branches. There are complex time data patterns for lower and higher task sites, which are structured in a hierarchical manner. We have already described simple Tδ(1,2,3....) and Tδ'(1,2,3...) analysis operations. 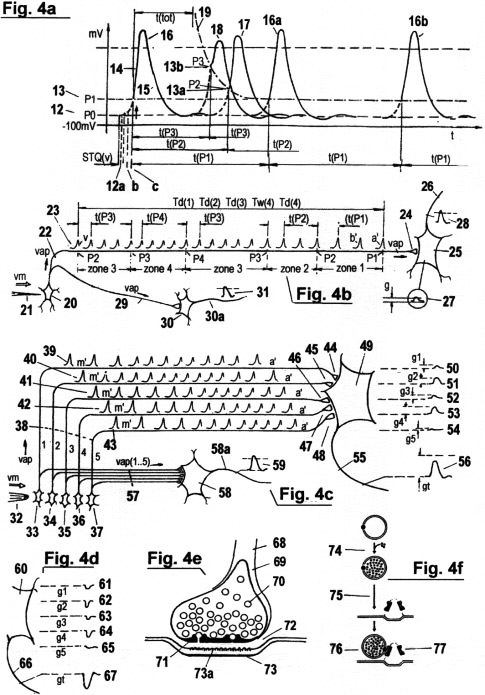 Blood circulation, respiration, co-ordination of muscle systems, growth, seeing, hearing, speaking, smelling, and so on, necessitate an extremely large number of synaptic recorded "landscapes" of the organism's STQ time patterns, produced by a variety of receptors; and which continually have to be analysed for isomorphism with time patterns currently being recorded. Accordingly, temporal and motoric auto-adaptation occurs in deeper and higher hierarchies and at various levels. Fig. 4d illustrate the counterpart to the EPSP (Excitatory Postsynaptic Potential): the "Inhibitory Postsynaptic Potential " , or IPSP. As seen in the figure, the IPSP potentials 61, 62, 63, 64 and 65 at the subsynaptic membrane 60 are negative compared to the corresponding EPSP's. IPSP's are produced by a considerable proportion of the synapses to effect pre-synaptic inhibition instead of activation. The example here shows an IPSP packet 67 propagating from the motoaxon 66 to a neuromuscular junction (or muscle fibre, respectively) which prevents this muscle from being activated - even if a supraliminal EPSP were to reach the same muscle fibre at the same time via a parallel motoaxon. Positive EPSP's ion fluxes and negative IPSP's ion fluxes counterbalance each other. The main function of the IPSP's is to enable co-ordinated and homogeneous changes of state in the organism, e.g. to enable exact timing of motion sequences. In order to ensure, for example, a constant arm swing, it is necessary to activate the bicep muscles, which then flex the elbow with the aid of EPSP's; but to inhibit the antagonistic tricep muscles (which extend the elbow) with the aid of IPSP's. Antagonist muscles must be inhibited via so-called "antagonistic motoneurons", while the other muscle is activated via "homonym motoneurons". The complex synergism of excitatory (EPSP) synapses and inhibitory (IPSP) synapses act like a feedback system (servoloop) and enables optimal timing and efficiency in the organism. One can compare this process with a servo-drive, or with power-steering, which ensures correct co-ordination and execution of current motion through data-supported operations and controls. If data are missing, the servoloop collapses. Disturbances in a molecular biological servoloop that is supported by STQ time data structures lead to tetanic twitches, arbitrary contractions, chaotic cramps and so on. From the point of view of cybernetics, each excitatory synapse generates a "motoric impulse" (EPSP), while each inhibitory synapse generates a "brake impulse" (IPSP). The continued tuning of the complicated servoloops, and the balance which results from continuous comparison of prior sensory experiences (the stored reference time patterns) with current sensory experiences (the time patterns currently being recorded), creates "perfect timing" in the organism. Fig. 4e shows the basic construction of a synapse. Axon 68 ends at the pre-synaptic terminal 69, which is also termed "bouton". The serial incoming AP's cause the vesicles to be filled with neurotransmitter molecules. When the filling process is finished, the vesicles begin to move in the direction of the pre-synaptic lattice 71. If a currently acquired time pattern is approximately isomorphic to an existing time pattern (see also Fig. 4b), then a small canal opens at an attachment site on the lattice, which releases the entire contents of the vesicle into the narrow synaptic cleft 72. This process is termed "exocytosis". The sub-synaptic neural membrane 73 supports specific molecular receptors 73a, to which the released transmitter molecules bind themselves. For a certain period, a pore opens, through which the transmitter substance diffuses. The conductivity of the postsynaptic membrane increases and the EPSP (following postsynaptic depolarisation) is triggered. The duration of opening of the pores and the recognition of complementary receptors by the molecules are likewise determined by auto-adaptive processes and evaluation of STQ time pattern structures. However, these molecular processes represent deeper sub-phenomena in comparison to synaptic processes. Structures for temporal and motoric auto-adaptation, which depend on quantization of STQ-elapse times, also exist at the molecular and atomic levels. Fig. 4f shows the filling of a vesicle 70 with neurotransmitting substances, and its subsequent motion towards a pre-synaptic dense projection at the lattice 71. The start of the filling process 74 can be seen as the activation of a stopwatch. The rate v(t) of the filling is proportional to the dynamics of the AP ionic flux into the synapse. The periods T(t...) of the filling follow the periods t(P1,P2,...) of the arriving AP's; these times, therefore, represent vm-adaptive quantized STQ(d) elapse times Tδ(1,2,3...). The direction of filling is shown at 75. The direction of motion of a vesicle is shown at 76. If the current velocity v(t), the duration of the vesicle packaging T(t), the quantity of transmitter molecules, the current vesicle motion and other currently significant STQ parameters have characteristics which correlate to an existing synaptic STQ structure, then a filled vesicle binds itself onto an "attachment site" 77 at the lattice. Ca++ ions flow into the synapse, a pore at the para-crystalline vesicle lattice opens, and the entire molecular neurotransmitter content is released into the synaptic cleft 72. At the postsynaptic membrane of the target neuron, these molecules are fused with specific receptor molecules. Such receptors have verification tasks. They prevent foreign transmitter substances (that originate from other synapses) from producing wrong ESPS's at this neuron. To complete the discussion of Fig. 4, we relate the descriptions of Figs. 4a, 4b, 4e and 4f to the STQ-configurations of Figs. 3a - g. For argument's sake, we assume once again that a pinprick impinges onto a receptor cell (see also Fig. 4b). The IP sequences shown in Fig. 3a correspond to the AP's 23 which are produced by stimulating a receptor cell 20 with a needle 21. Their periods t(P1), t(P2),... serve to classify the respective zones of stimulation intensity (P1, P2...) or perception intensity (Z1, Z2... ). Each AP 23, arriving into a synapse 69, activates the adaptive quantization of STQ(d) elapse times, depending on the velocity vap of the propagation of the AP along the axon. Elapse timing with modulated time base is triggered as soon as a vesicle begins to fill. Finished filling (packaging) signifies "elapse timing stop, STQ(d)- quantum recorded". The elapse times Td(1), Td(2), Td(3), Td(4).... thus recorded generate the significant synaptic structures. Invariant time counting pulses ITCP (see Fig. 3b) with frequency fscan correspond to constant axonal AP propagation with velocity vap, if no dynamic stimulus appears at the skin receptor cell (for example, if a needle remains in a fixed position and generates a constant stimulation intensity). In this case, the receptor membrane senses no relative speed vm; the AP's propagate with constant velocity vap along the axon 22; and the synapse quantizes the STQ(d) elapse times with invariant time counting frequency fscan. Time counting pulses VTCP (see Fig. 3c) with variable frequency ƒscan are then applied, if dynamic stimulation affects the receptor. The AP's propagate along the axon with STQ(v)-dependent velocities vap(n...), modulated by the variable dynamics vm(n...) which are measured as an STQ(v) parameter by the membrane. Adaptive alteration of all of the following processes occurs in a similar manner: the variation of time counting periods t(P1... .n) corresponding to the points 2.1, 3.1, 4.1 in Fig. 3c; the velocities v(t....) of AP ionic flux into the synapse; the vesicle filling times T(t...); the amounts of transmitter molecules contained in the vesicles; the motion of these molecules in the direction of the vesicle lattice; the structure of this lattice; and many other parameters of the presynaptic and subsynaptic structures. A synapse has features that enable the conversion of the AP influx dynamics into vap-proportional molecular changes of states. This is like the variable VTCP time counting pulses seen in Fig. 3c. The process can be compared with variable water pressure driving a turbine, through which a generator produces variable frequencies depending on pressure and water speed: higher water pressure is akin to higher stimulation dynamics vm at the receptor, higher AP propagation velocity vap along the axon, and higher VTCP time pulse frequency ƒscan in the synapse (which in turn affects not only the rate v(t) with which vesicles are filled, but also many other synaptic parameters). 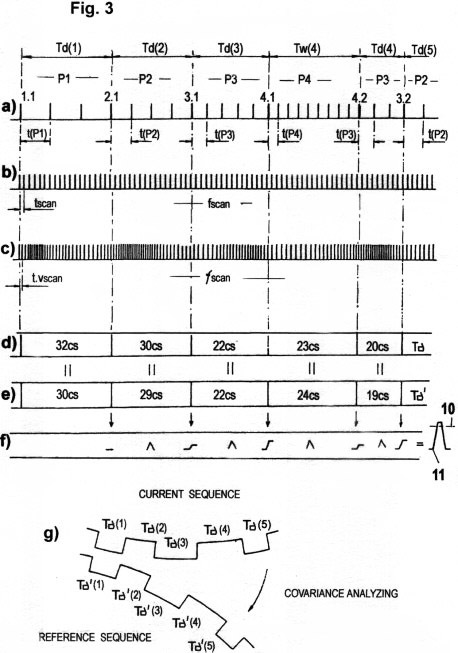 According to these processes, the STQ(d) time sequence Td(1, 2, 3, 4...) is recorded in the synapse with vm-modulated time counting frequencies ƒscan(1,2,3...); as a consequence, the physical structure of the synapse is determined by this time sequence. Fig. 3d shows a currently acquired time data sequence 32 30 22 23 20 that is equivalent to the recorded time pattern Tδ(1,2,3..), and which leaves a specific molecular biological track in the synapse 24. The prior acquired time data sequence 30 29 22 24 19 in Fig. 3e corresponds to the synaptic structure that has been "engraved" through frequent repetition of particular stimulation events and time patterns Tδ'(1,2,3...).The manifested synaptic Td' structure can be considered also as a bootstrap sequence that was generated by continuous learning processes and perception experiences, and which, for example, serves as a reference pattern for the event "pinprick". If a newly acquired Td bootstrap sequence – which is given by the current properties of the vesicle filling, as well as other significant time dependent parameters - approximately keeps step with this existing Tδ' (bootstrap sequence (or with a part of it), then "covariance" is acknowledged in the synaptic structure. This opens a vesicle attachment site at the synaptic lattice and results in the release of all transmitter molecules that are contained in a vesicle, whereupon an EPSP is generated at the sub-synaptic membrane 25. The potential of an EPSP corresponds to the probability density parameters shown in Fig. 3f, which are significant for the currently evaluated covariance. If such "probability density parameters" sum within a certain time interval to a certain threshold potential 27, an AP 26 is produced. This AP serves as confirmation of the event "pin recognized", and produces a muscle reflex. The comparison of the current elapse time pattern with prior recorded elapse time patterns, as shown in Fig. 3c, takes place continuously in the synapses. Each recognized covariance of a new time sequence, that is recorded by "temporal auto-adaptation", sets a type of "servoloop mechanism" in motion. It initiates a process that we term "motoric auto-adaptation", and which can be understood as the actual "motor" in biological chemical organisms, or life forms, respectively. Structures of temporal and motoric auto-adaptation, which are based on STQ quantization, exist also at the lowest molecular level. Without elapse time-supported servoloops, co-ordinated change in biological systems would be impossible. This applies especially to the motion of proteins; to the recognition and replication of the genetic code; and to other basic life processes. The creation of higher biological/chemical order and complex systems such as synapses or neurons presupposes the existence of an STQ quantization molecular sub-structure, from which simple acknowledgement and self-organization processes at a lower level derive. Indeed, there are innumerable hierarchies of auto-adaptive phenomena on various levels. Simple phenomena on a molecular level also include: fusion of receptor molecules; the formation of pores, ion canals and sub-axonal transportation structures (microtubules); and the formation of new synapses and axonal branchings. By this token, recognition of stimulation signal sequences by synaptic time pattern comparison (as an involuntary reflex or as a conscious perception), as discussed in the description of Figs. 4a - c, is an STQ-epiphenomenon. Each such auto-adaptive STQ-epiphenomenon, for its part, is superimposed from STQ-epiphenomena of higher rankings; for example, the analysis of complex "time landscapes" in order to find isomorphism. STQ-epiphenoma such as regulation of blood circulation, body temperature, respiration, the metabolism, seeing, hearing, speaking, smell, the co-ordination of motion, and so on, are for their parts superimposed from STQ-scenarios of higher complexity, including consciousness, thought, free will, conscious action, as well as an organism's sensation of time. In all these cases, the central nervous system looks after convergent time patterns that are placed like pieces of a jigsaw puzzle into an integrated total sensory scenario. If, in any hierarchy, within a certain "latency time" (i.e. time limit) and despite intensive "searching", no time subpattern covariant with the STQ time pattern can be found, then the organism displays chaotic behaviour. This behaviour restricts itself to that synaptic part in which the non-convergence has appeared. As soon as a covariant time pattern is found, the co-ordinated process of temporal and motoric auto-adaptation (and auto-emulation) resumes. (This can be likened to servo-steering that has collapsed for a short time.) However, the "chaotic behaviour" is itself quantized as an STQ time pattern, and is recorded by the affected synapses in such a manner that no neurotransmitter substance release occurs despite arriving AP's. Via subaxonal transportation structures (i.e. the microtubules) such information streams back borne on transmitter molecules which travel in the inverse direction along the axon. Microtubules are used to generate new synapses and synaptic connections at the neurons and neural networks in which a collapse of an auto-adaptation process has occurred. The production of new synapses proceeds to the generation of dendrites; i.e., axonal branches that carry processing information from neurons. In this way the auto-adaptive neural feedback mechanism regenerates itself, and the time pattern that was acquired during the short termed "chaotic behaviour" becomes a new reference basis for the recognition of future events. Thus, the CNS learns to record new events and experiences; and learns to evaluate time patterns which were unknown previously.